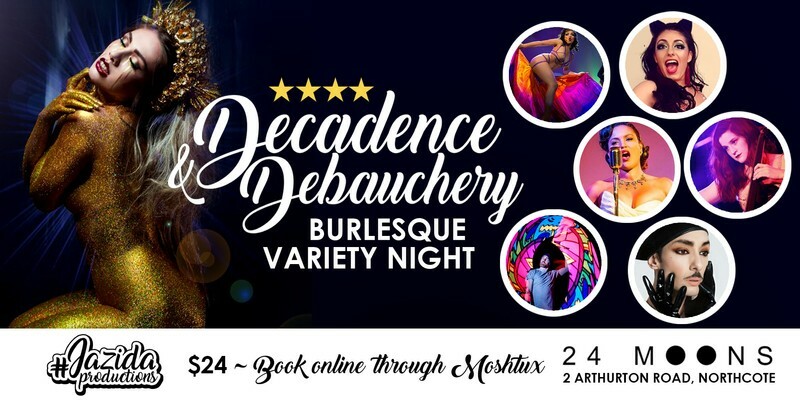 After sold out and acclaimed shows in Canberra (bringing audiences of over 230 people), at the Adelaide Fringe Festival and in Batemans Bay, “Decadence and Debauchery” is coming to Melbourne for the first time! This is a burlesque variety night of intercultural artists sharing vintage striptease, fan dancing, sideshow, live music, comedy and more! UK Performer. A charismatic MC extraordinaire this cockney charmer dazzles the audience with her ferocious presence. Having jetted across the globe, performing Vaudeville and Burlesque in the UK, Italy, New Zealand and Melbourne and Sydney, she is here to split your sides and tickle your fancies. Melbourne Performer. An acclaimed, multi-discipline artist of unrivalled style and sensual sensibility. Known as the ‘boy beauty’ of burlesque and having toured across the world, the allure of his languid frame and liquid movement will have you at attention from opening curtain. Lady For and Diddy Reyes make up the incredible jazz/blues duo Diamonds and the Blues. The duo are a Victorian collaboration, combining the sultry sounds vocal sounds of Lady Fox with the Mod Popping Blues Rock of Diddy Reyes. Canberra Performer. Fire twirler performing with programmable LED pixel poi. Competitor in the National Fire Twirling championships in 2012. Canberra Performer. 2019 Canberra Burlesque Idol and Miss Burlesque ACT Finalist! A long term fan dancer and teacher with Jazida Dance Classes. Melbourne Performer. A conjuror, orchestrating beautiful ambient soundscapes in which time stands still, leaving audiences speechless. She graces the stage armed with just a cello and experimental technology building layer upon layer of sound into ethereal moments in time. Doors open at 7:30 for a show that starts at 8:00pm. Any enquiries, please email jazidaproductions@gmail.com.